Originally published on March 28, 2016. 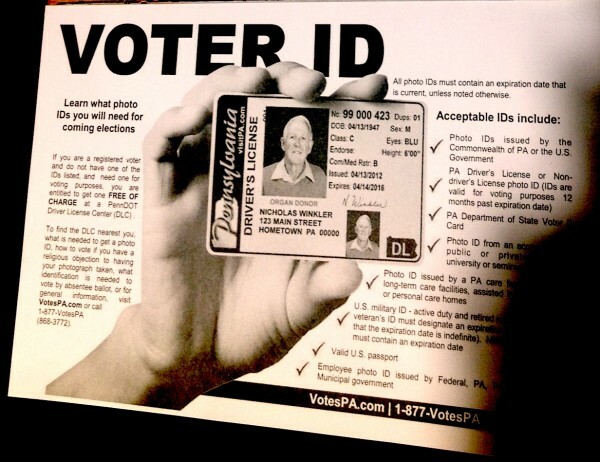 Strict voter identification laws are proliferating all around the country. In 2006, only one U.S. state required identification to vote on Election Day. By now, 11 states have this requirement, and 34 states with more than half the nation’s population have some version of voter identification rules. With many states considering stricter laws and the courts actively evaluating the merits of voter identification requirements in a series of landmark cases, the actual consequences of these laws need to be pinned down. Do they distort election outcomes? Arguments rage about these laws. Proponents claim that voter identification rules are necessary to reduce fraud and restore trust in the democratic system – and they point out that identification rules are popular and do not preclude legitimate voters from participating. In the view of supporters, no new barriers are raised for the vast majority of American voters who already have the necessary forms of identification – and for those who don’t, the new hurdles are small and easily surmounted. But critics argue that voter identification laws limit election participation by racial and ethnic minorities and other disadvantaged groups. There is no good reason to enact these impediments, critics claim, given little documented evidence of fraud by individual voters. Opponents believe that GOP legislatures and governors are instituting these laws to discourage Democratic voters and bias election outcomes in their party’s favor. Who is right? Researchers have shown that racial and ethnic minorities, the poor, and younger Americans are disproportionately likely to lack legally specified kinds of identification – which means they must take extra steps to qualify as voters. Other studies have found that poll workers apply these rules unevenly across the population, disproportionately burdening minorities. Nevertheless, the key question is not whether there could be worrisome effects from these laws, but whether clear-cut shifts in election participation and outcomes have actually occurred. 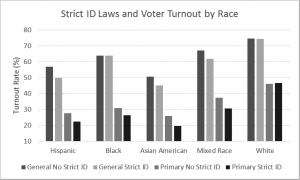 Do voter identification laws reduce participation among specific segments of the population? Do they skew the electorate in favor of one set of interests over others? By focusing on U.S. elections from 2006 to 2014 and using validated voting data from the Cooperative Congressional Election Study, our research team has found more definitive answers. Because our data include large samples from every state in each election cycle, we can analyze voter turnout for various sub-groups – to see if states with strict voter identification rules exhibit different patterns than those without such rules.With many states considering stricter laws and the courts actively evaluating the merits of voter identification requirements in a series of landmark cases, the actual consequences of these laws need to be pinned down. Do they distort election outcomes? 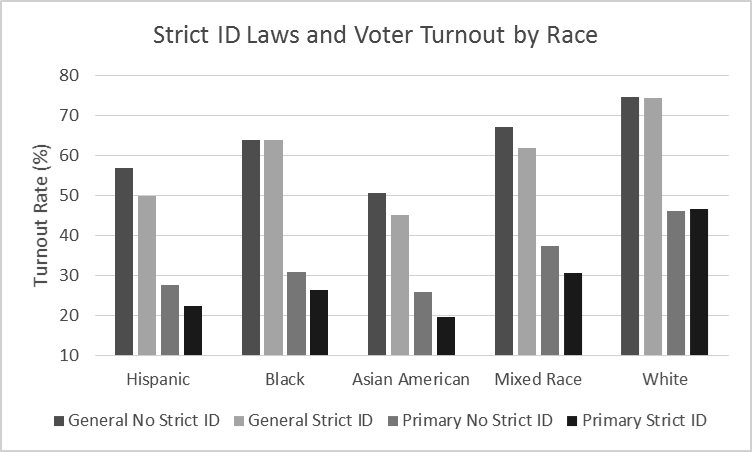 Our findings are clear: strict voter identification laws double or triple existing U.S. racial voting gaps, because they have a negative impact on the turnout of Hispanics, blacks, and Asian Americans, but do not discourage white voters. In general elections, Hispanic turnout is 7.1 points lower in general elections and 5.3 points lower in primaries in states with strict identification laws, compared to turnout in other states. For blacks, the drop is negligible in general elections but a full 4.6 points in primaries. Finally, in states with strict rules, Asian American general election turnout falls by 5.4 points in general elections and by 6.2 points in primaries. Whites are little affected, except for a slight boost in their turnout for primaries. These findings persist even when we take many other factors into account – including partisanship, demographic characteristics, election contexts, and other laws that encourage or discourage participation. Racial gaps persist even when we limit our analysis to Democrats or track shifts in turnout in the first year after strict rules are implemented. Do these laws advantage one party over the other? We found little consistent impact in general elections, but clear effects in primaries. In states that institute strict identification laws, the primary turnout gap favoring Republicans more than doubles from 4.3 points to 9.8 points. Likewise, the turnout gap favoring conservatives over liberals goes from 7.7 to 20.4 points. In U.S. states with strict voter identification rules, the voices of Latinos, blacks, and Asian American voters become more muted as white voter influence grows. U.S. elections have long had a racial skew in favor of whites – and these recently proliferating laws make the imbalance worse. Furthermore, when the new rules go into effect, the influence of Democrats and liberals wanes compared to the clout of Republicans and conservatives. If courts considering the fate of voter identification laws want to understand their actual impact, the evidence that they distort American democracy is clear and convincing. Read more in Zoltan Hajnal, Nazita Lajevardi, and Lindsay Nielson, “Voter Identification Laws and the Suppression of Minority Votes,” University of California, San Diego, 2016. If you are interested in joining SSN as a Scholar member or Affiliate member, please read the "Guide to Membership in SSN" and contact SSN's Executive Coordinator Lizzy Ghedi-Ehrlich for more information. If you are already a member, please visit our Resources for Members page for access to your Regional and Working Groups, tip sheets and instructions for using the site, and other useful materials. Why Does Immigration Arouse Deep Feelings and Conflicts?